Last summer some bathers in Cork got quite a shock when a giant basking shark decided to pay a visit to Cape Clear bay. Some documentary makers just happened to be in the right place at the right time, and managed to capture some amazing footage of the huge creature (which is harmless). Producer Jason Gaffney said they were shooting footage for their new documentary titled Aonrú - which is about the island’s demise – and were fortunate enough to be shooting when the shark arrived near some kayakers. 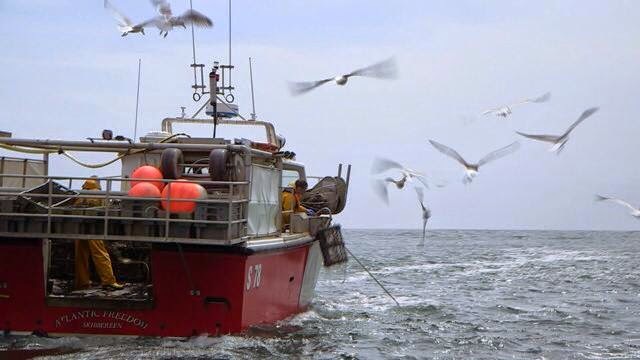 The footage of that day plays just one small part in a film that hopes to capture the lifestyle of people living on Cape Clear Island, their fears about the future and their perspective on how and why the fishing industry fell into such rapid decline, said Gaffney. 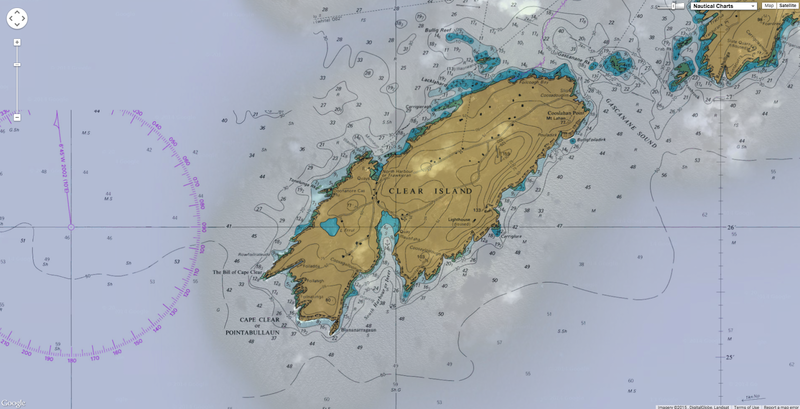 We also wanted to shoot the island in a way that would bring it to a wider audience. 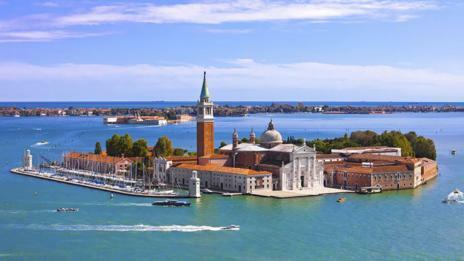 It’s a stunning part of the world and one that few people know about. Aonrú presents a unique portrait of the island from the air, the ground, the sea and beneath the water. A richly textured documentary essay on isolation, history, loss and change Aonrú offers a unique exploration of Cape Clear Island, West Cork and the extinction of its indigenous fishing industry. Fussing archive footage and experimental camera techniques this portrait of an island facing uncertainty celebrates one of mankind's oldest endeavours and questions its place in modern day rural Ireland. From April 9 to April 30, 2015, join us LIVE from the seafloor as NOAA Ship Okeanos Explorer explores the largely uncharted deep-sea ecosystems and seafloor in the vicinity of Puerto Rico and the U.S. Virgin Islands. While we think of the cosmos as being full of mystery, there are plenty of unexplored places remaining on our own planet — under the oceans. Only about 5% of the Earth's sea floor has been explored. But now, thanks to a robotic submarine deployed by the National Oceanic and Atmospheric Administration research ship Okeanos Explorer, we'll all be able to go online and take a peek at some of that unknown territory in the Caribbean Sea and the Atlantic Ocean. The just-started mission will send the robotic sub on 20 dives, some of them as much as 3.7 miles deep, according to a NOAA press release. Many of those dives will take place in the Puerto Rico Trench, a 500-mile-long stretch of the sea floor that in some places is 5.4 miles deep, making it the deepest part of the Atlantic Ocean basin. Other areas to be explored include the Muertos Trough, Mona Channel and Virgin Islands Trough. The robotic sub — in NOAA lingo, a remotely-operated vehicle, or ROV — will continuously capture high-definition video, which the public will be able to view on this website. While the area to be explored is uncharted, scientists know that it has a lot of tectonic plate activity and is a potential source of earthquakes and tsunamis. They also suspect that it contains geological figures such as seamounts and mud volcanoes. Okeanos Explorer recently finished mapping 13,600 square miles of seafloor around the U.S. Virgin Islands and Puerto Rico, gathering data that will be used by biologists, geologists, oceanographers and geophysicists. Live video from a 2013 expedition to deep-sea canyons off the northeast Atlantic coast of the United States garnered more than 875,000 views. 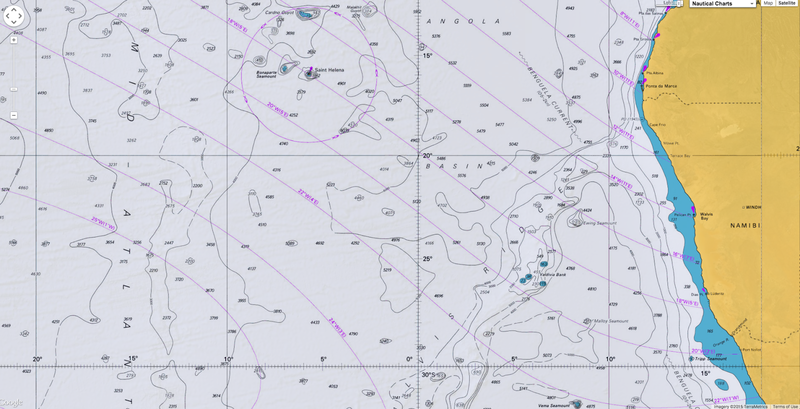 In response to user feedback and an improved understanding of how the publication is used, the United Kingdom Hydrographic Office (UKHO) has published the Tenth Edition of the ADMIRALTY Mariners Handbook (NP100), which is available in both printed format and as an e-NP. First published in 1962, the tenth edition is now easier to use and understand. NP100 has long been acknowledged as an essential, ‘must-have’ publication for all seafarers, maritime training schools and shipping company offices. 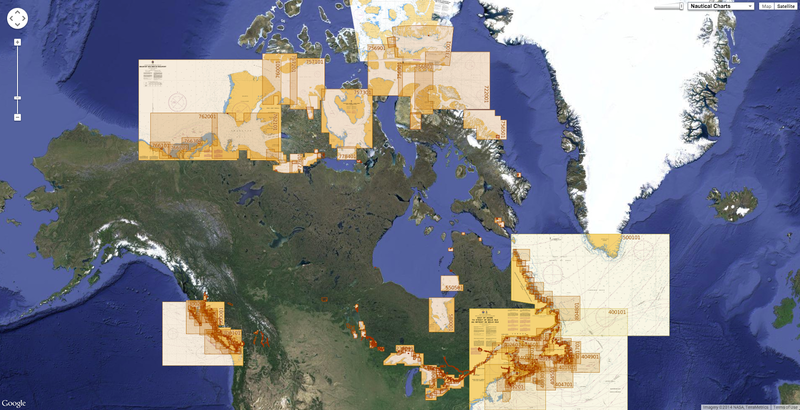 NP100 provides maritime information on charts and their use, the communication of navigational information, the maritime environment, including sea and ice conditions, restrictions to navigation and maritime pollution and conservation (MARPOL). The handbook also contains COLREGS information, a comprehensive description of the IALA Maritime Buoyage System and an improved glossary of nautical terminology. Key improvements include an improved structure and tabular layout to the handbook, making it quicker and simpler for mariners to locate the exact information that they need and the addition of QR codes throughout the publication to increase usability and ensure that the most current data is available. The glossary section of NP100 has been re-written, laid out in tabular format and complemented by additional images and diagrams to provide seafarers with a better understanding of the relevant terminology, as well as improved comprehension for those who don’t speak English as their first language. This edition supersedes the Ninth Edition (2009), which is cancelled. For more information on the NP100, visit the UKHO website or contact any ADMIRALTY Chart Agent. setting a new world depth recovery record. For comparison, Titanic rests at a depth of 12,500 feet (3,800 meters, or 3.8 km). Underwater salvage company Deep Ocean Search has successfully salvaged the treasure ship SS City of Cairo. Found at a depth of more than 17,000 feet, the ill-fated World War II-era steamship was loaded with 100-tons of silver coins. She was spotted by U-68 on the 6th of November 1942 and torpedoed at 2030 hrs. The engines were stopped and preparations made to abandon ship. A second torpedo was fired 10 minutes after the first and the ship sank a few minutes later. about 450 miles south of St. Helena. The surviving crew and passengers were in the lifeboats when the submarine approached to question captain Rogerson. The U-Boat captain, Karl-Freidrich Merten, told him how far he was from Brazil and left saying, “goodnight, sorry for sinking you” (which became the title of a book on the loss of the City of Cairo, by R. Barker). The survivors were soon separated into two groups. One boat was picked up by a German blockade runner, which was subsequently intercepted by the HMS Scylla and was scuttled on 1st January 1943. 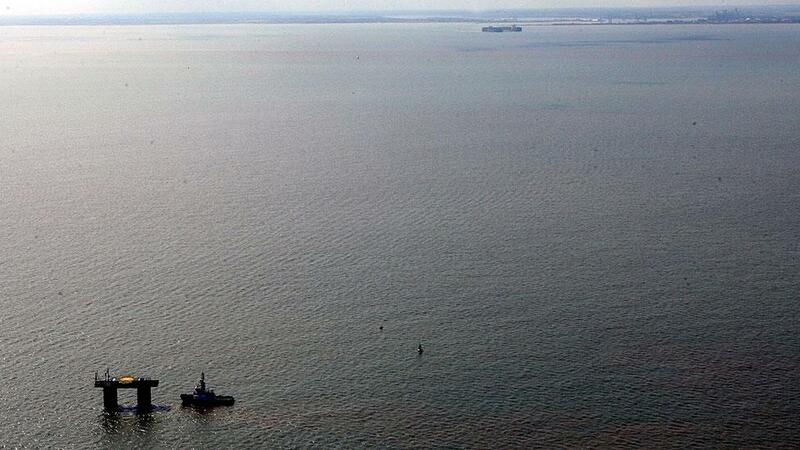 One lifeboat made it almost to Brazil before survivors were rescued. The master and 154 of the survivors were picked up by the SS Clan Alpine and landed on St. Helena island and another 47 people were picked up by the British steam merchant ship Bendoran and landed at Cape Town. In all 104 people died, 79 crew, 3 gunners and 22 passengers. On November 6, 1942, the SS City of Cairo, 8034 tons, Ellerman Lines Ltd, London, while on route from Bombay - Durban - Capetown - Pernambuco, Brazil - UK, was torpedoed by the U-68. She was carrying 7422 tons of general cargo, including pig iron, timber, wool, cotton, manganese ore, and 2000 boxes of silver coins (3 million ounces). A second torpedo caused the ship to sink by the stern. Deep Ocean Research (DOS) decided to look for the wreck of the SS City of Cairo and in November 2011 started operations. This was to be a difficult search as the water depth would exceed 5000m, the weather, swell and currents were known to be challenging and the presumed site was some 1000 miles from the nearest land in the foothills of the mid-Atlantic ridge. Our research came up with the usual contradictions between the positions given by the submarine and that from the ships officers. A large search box was put together to try to reconcile these diverse statements. The seafloor was difficult with ridges and canyons throughout the area and the water depth varied between 5100 and 5500m. A small target with little height and reflectivity was seen in amongst a hillside and was subsequently dived upon, with some reluctance, as it didn’t correspond to our expectations of what a wreck should look like at all. However, DOS’s procedures require that all targets which appear not to be natural be inspected. It turned out that it was a wreck and the identity was finally confirmed to be that of the City of Cairo. The ship was broken in two and buried deep in the seafloor silt. Parts of the ship had meters of mud heaped upon it, which goes some way in explaining the lack of height and of reflectivity. The team quickly found that operating at this depth caused serious technical difficulties which were new to us and which had to be resolved, quickly. The combination of pressure, temperature, repeated dives at this depth and other issues resulted in multiple breakdowns of systems such as we had not experienced before when working in 3000 - 4000m depths. Some of these issues were new to our suppliers too. However our team overcame them which resulted in our ability to make our equipment work non-stop for days on end at these extreme depths - an invaluable and critical lesson for DOS for the future. Many items were seen on and around the wreck including the end section of the second torpedo, where the contra-rotating propellers could clearly be seen. Apart from the silver cargo this was the only item recovered from the site. At the crest of a swell, an orange wing sticks straight up out of the ocean, like the fin of a miserable orca waving to the crowd at SeaWorld. That speck of color some 800 feet from the research vessel Paragon is part of an advanced seagoing robot, a drone, and the wing contains its antenna—which is talking to a satellite, which is talking to our skipper’s cell phone. Once we’re alongside the machine, a scientist stretches to snag a loop on the 100-pound robot with a hooked pole, then starts hefting the drone up. Another researcher grabs halfway down the body, and together the two men lug the drone aboard and gingerly place it on a stand. We’re bobbing in the sea just south of Santa Cruz, California; the Paragon is a pickup truck-shaped vessel, cabin in front and a flat deck with edges about a foot high, run by the Monterey Bay Aquarium Research Institute. There’s no bathroom on board. “Guys, it’s super easy. Any time, you’re welcome to go over the side,” says Jared Figurski, the MBARI marine operations division’s jack of all trades. While the old adage goes that scientists know more about the surface of the moon than the seafloor, that’s a two-dimensional way of thinking. The oceans remain mysterious up and down the water column: the incredibly complex chemical and biological relationships, or how exactly the oceans are changing under the weight of global warming and other human meddling … acidity, temperatures, currents, salinity. And the most powerful tool to help figure all that out is the drone. MBARI has a fleet of them, three different kinds—autonomous machines that prowl the open oceans gathering data, allowing researchers to monitor it in real time. The machines do not tire, and they cannot drown. They can roam for months on end, beaming a steady stream of data to scientists sitting safely onshore. So while aerial drones may get all the love, it’s autonomous underwater vehicles like the one the Paragon just snagged that are doing the grunt work of ocean science. They’re the vanguard of the robotization of Earth’s oceans. Their arrival couldn’t come at a better time. The oceans are in big, big trouble. A study released in January found that we humans are on the verge of initiating a mass marine extinction with a dizzying number of threats. Global warming is heating the oceans, forcing fish into new distributions. The seas are absorbing the carbon dioxide we’re pumping into the air, leading to acidification that damages coral reefs. 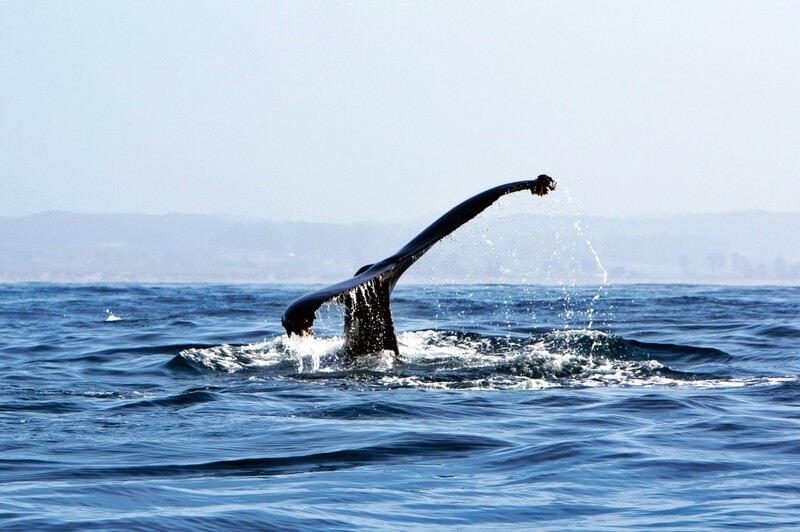 Cargo ships are slamming into whales. I could go on, but I’m probably depressing you. The glider the Paragon picked up had been roaming for three or four weeks, but robots can potentially rove for six months, traveling some 2,500 miles. It’s a simple design with an energy-saving trick: no traditional motor. Instead, “they change their buoyancy,” says senior MBARI scientist Francisco Chavez. “They move the center of gravity forward so they point down,” then modify their buoyancy to float closer to the surface, over and over, up and down. In the air, a glider’s wings generate lift, relying on rising columns of air called thermals to get an extra boost. With an underwater robot, those wings provide “lift” to keep it gliding too—without them, it’d sink straight down and bob right back up. Buoyancy takes the place of a thermal. The robots’ routes therefore resemble really long sine waves. And if they need to turn? “They can move their center of mass by moving their batteries either left or right,” says Chavez. All the while the drones collect troves of data, including temperature, salinity, pressure (a proxy for depth), and oxygen levels. For salinity, the drone is measuring the conductivity of seawater, then using that value to calculate how much salt is present. The oxygen sensor operates on a similar principle, passing water through a semi-permeable membrane, behind which is a chemical solution with electricity coursing through it. The amount of oxygen changes the voltage. And drones map the seafloor with sonar, firing sounds downward and measuring the echoes to reveal the terrain. Not all drones are as simple as the glider. On the other end of the spectrum is a fully motorized version, 8 feet long and almost 2 feet wide with a big propeller on the end, like a torpedo. It can only last a few days out on its own, but while the glider is limited to depths of 650 feet, the big AUVs can dive over a mile. Plus they can collect biological material—scales and plankton and flesh and such—by opening one of 10 spring-loaded cylinders and grabbing a water sample. “You watch CSI, right, or something like that?” asks Chavez. Sequencing whatever tissue the big drones pick up gives the researchers an idea of what animals are in a given area—but not how many of them there are. Population size remains a challenge. Rounding out MBARI’s fleet is a third, middle-ground variety. Like the big AUV, it has a propeller, but it can also switch to the sine-wave propulsion of the glider, hitting distances of 600 miles. This one’s referred to as a long-range AUV, and MBARI has some seriously excellent ideas for its future. “We expect that someday the long-range AUVs will be operational in the sense that they will be able to pull into an underwater docking station, recharge, drop off whatever they have to drop off—be it data or samples—and then continue out on their mission,” says Chavez. It’ll be like a Roomba returning to its station to juice up, only it’ll be packed with science instead of cat hair. The fleet has collected an almost unimaginable amount of data, between mapping the seafloor and monitoring microscopic oceanic life and measuring salinity. It’s numbers upon numbers upon numbers. So many numbers, in fact, that MBARI had to build a whole new database to organize it all. While we’re at it, someone thought, why don’t we just pipe the data into a virtual-reality headset so we can fly around the seafloor? Back on land, MBARI software engineer Mike McCann asks if I want to be Superman. I say OK, sure (I guess I’d be a fool not to), so he sits me at his desk and has me strap Oculus Rift virtual-reality goggles to my face. And soon enough I’m flying through layer after layer of horizontal grids. A motion sensor, the same sort of tech as the Xbox’s Kinect, has digitized my hands, so if I move them left or right, I turn. Up and down adjusts my elevation, and to stop I simply raise my palms. McCann hopes to someday replace this simple environment with a realistic model of the ocean, using data collected from AUVs. “It’s a ton of data,” he says. There’s already a simple version of this, which you can see in action below. That’s the undulating path of a drone, with the colors representing concentrations of phytoplankton (high values being red and low being purple), tiny plant-like organisms that sit at the base of the food chain, that the robot had collected. That’s the seafloor below, imaged by a shipboard sonar system. with colors representing concentrations of phytoplankton. Remember when I said mapping the seafloor is a dated, two-dimensional way of thinking about the oceans? 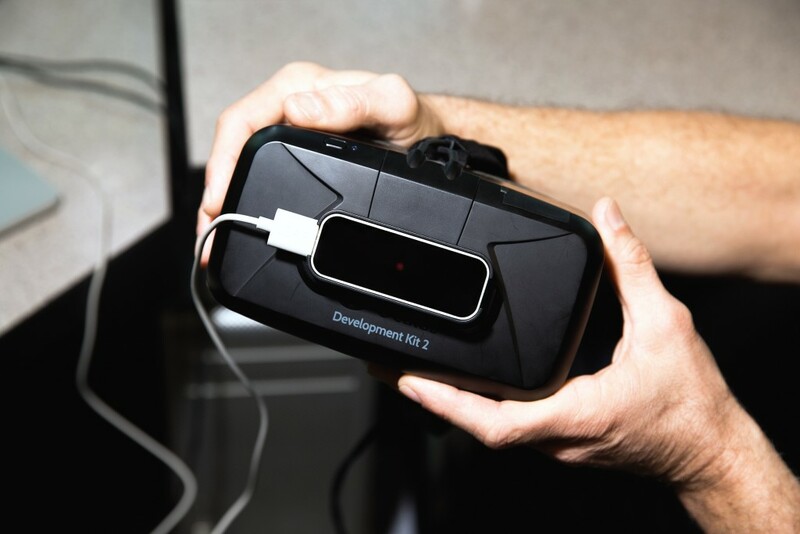 This VR software is the beginning of a full-blown 3-D approach. Soon enough, scientists won’t always need to sort through line after line after line of data. That data will be a ride. “Well, just to be honest, it’s still very experimental,” McCann says. But, he adds, “the potential is great because we can create a full 3-D virtual environment with animations, and those could include vertical migrations of animals as measured by the robots”—vertical migrations being the movement of creatures at night toward the surface, then down into the dark depths when the sun comes up, then back again. Engineers at the Monterey Bay Aquarium Research Institute (MBARI) have developed a software package to help scientists visualize and understand complex oceanographic processes. 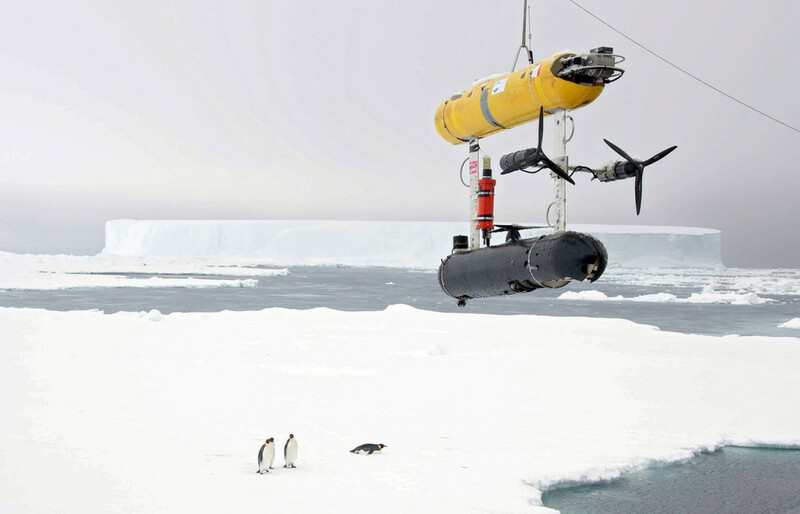 The free and open source Spatial Temporal Oceanographic Query System (STOQS) helps researchers deal with the large quantities of data produced by modern robotic platforms. But first they have to get all of that AUV data into the Oculus. That heavy lifting fell on McCann, who developed the Spatial Temporal Oceanographic Query System, aka STOQS (pronounced “stokes”), database software that compiles and visualizes the tens of millions of data points that a single robot can collect over a month. Instead of just listing a bunch of figures, STOQS links every figure to every other figure, allowing researchers to compile complex visualizations—a godsend when you’re trying to understand the ocean’s complicated and interconnected phenomena. Temperature and oxygen figures are intertwined, for example (cold water can hold more dissolved oxygen), and can’t just sit isolated. And this is all open-source, so any other institution can incorporate it into a drone program. Efficient analysis of growing types of oceanographic observations requires new approaches in data management. This presentation will demonstrate such capabilities using data collected for the purposes of understanding zooplankton and primary production ecology in the coastal upwelling environment of Monterey Bay, California. McCann walks me through STOQS on his computer, clicking through all manner of measurements—actually taken a couple of years before by the very glider Paragon retrieved—visualized as bar graphs: oxygen, salinity, etc. The salinity bit looks weird, though, with a few conspicuously red bars. “These are obviously some data errors, probably sucked up a jelly or something and it wasn’t able to measure salinity right,” McCann says with a laugh. He gets to a map that shows the route the glider had been programmed to follow and clicks a button that turns it into that kind of Oculus 3-D map you saw above, with the robot’s wavy path cutting through the water. Its undulations are color-coded to show what concentrations of salinity the robot encountered at any given point. The figures aren’t just numbers anymore, or even your average visualization—they’re the robot’s 3-D journey through Monterey Bay. I ask McCann, “What about loading the drones with video cameras and piping that video into the Oculus?” He says, oh hell yeah—though not in those exact words—but yes, it’d be totally doable. So just imagine, someday you might find yourself with a computer strapped to your face, drifting through the deep as bioluminescent critters pop all around you. Then, inevitably, a giant squid will rocket up from the depths and give you a full-blown VR panic attack. 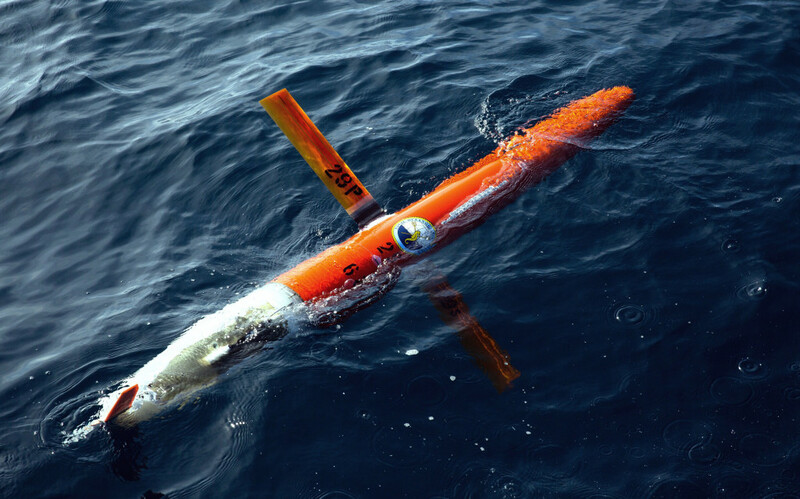 MBARI isn’t the only place where AUVs are changing ocean research. Clear across the continent in Massachusetts, the Woods Hole Oceanographic Institution, home of the famed Alvin crewed submersible, maintains its own fleet. WHOI gussied Alvin up with a slew of upgrades last year, but like the folks at Monterey Bay, its focus has been shifting toward AUVs. 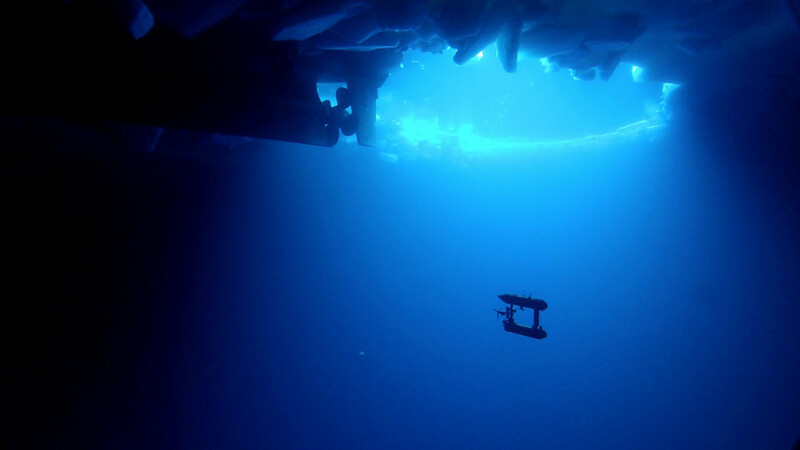 Its vision for the drone-y future is different than Monterey Bay’s, though—Woods Hole researchers are focused on using drones in often dangerous shallow water expeditions, not so much sending them into the open ocean. “We started out saying, ‘Look, we don’t want to go to the deep ocean, which is where these other vehicles go,'” says Hanumant Singh, a roboticist at Woods Hole. Want to count some fish or monitor penguins? Give Woods Hole a call. Need to explore the edge of a glacier—an incredibly dangerous task for a human, what with all the falling ice? A robot can do it. WHOI’s drones have monitored radiation levels around Japan post-Fukushima and determined the coastal impacts of Hurricane Sandy. And unlike Monterey Bay’s drones, WHOI’s take video in addition to sampling things like temperature and salinity. But this isn’t a competition. By deploying the different techniques, Woods Hole and Monterey Bay are collecting a huge range of data. Woods Hole is doing more immediate work, say, checking on the health of a coral reef, while Monterey is building something on a grander temporal and spatial scale. “If we only did one, if we only did research expeditions, that wouldn’t be right,” says Singh. Woods Hole has open-sourced their AUV designs, and will even build the things at the request of other institutions. “Even just 20 years ago we were very data poor in the oceans,” Singh says. 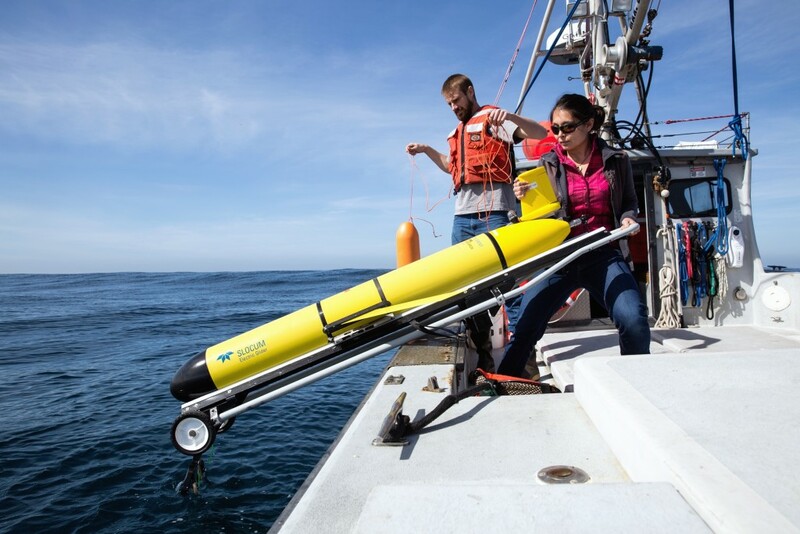 More and more it’ll be the AUVs that will help scientists better understand our changing seas: Monterey Bay’s gliders out taking the Pacific Ocean’s temperature and gulping up water samples, WHOI’s expeditionary drones checking in on reefs and glaciers. And sure, at this point researchers are only touching a fraction of what’s out there. Picking up an aging underwater robot isn’t the Paragon’s only mission on our trip off Santa Cruz. Lauren Cooney, a consultant with Teledyne Marine Systems, has hitched a ride to launch its latest, greatest model of glider. It looks a lot like the one the Monterey Bay scientists collected, but it’s shinier—a brilliant yellow—and has a propeller to power it in a pinch. As it sits on the deck, Cooney runs diagnostics on her laptop from the cabin, spinning up the propeller and such. When it comes time to launch, the skipper ties a rope with a trailing floatie around the glider’s tail (if something goes awry, that floatie will save Cooney the embarrassment of losing a robot worth tens of thousands of dollars). The glider is on a stretcher of sorts, two perpendicular metal poles, which Cooney and the skipper drag around, pulling one end over the edge of the boat. 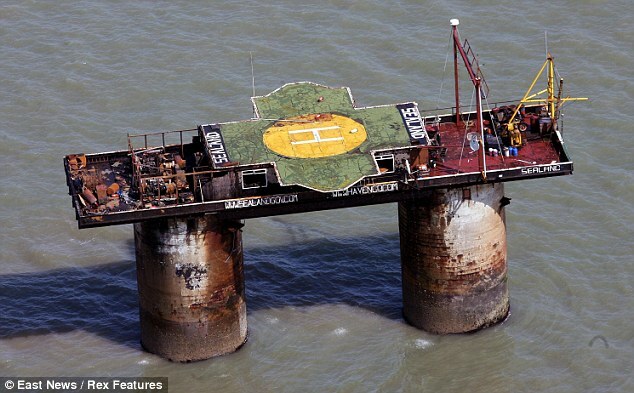 Cooney picks up the other end and without fanfare hefts it up, sliding the robot into the sea. It sinks a bit until the floatie holds it. As the Paragon pulls away, Cooney runs still more diagnostics, testing the robot’s ballast, floating and sinking it. When she’s satisfied, we approach again, and another scientist snags it by the rope and slices it off. Cooney performs the ballast test once more and, satisfied, tells the skipper we can return to shore. 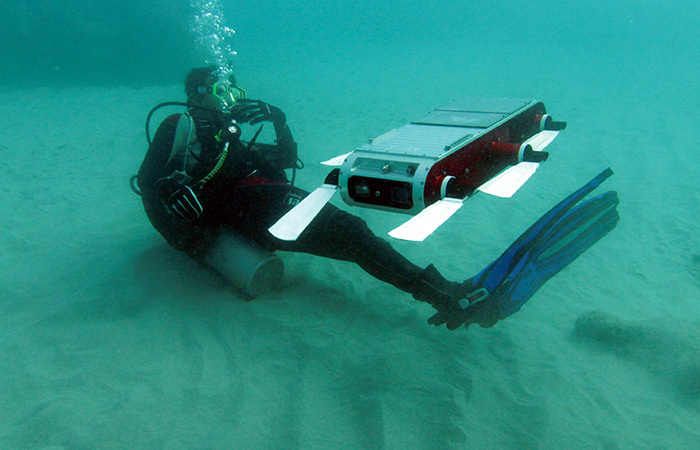 The newest underwater robot sinks slowly under the waves, disappearing into the dark unknown. Coral on Australia's Great Barrier Reef, which has now been added to Unesco's list of world heritage sites 'in danger'. The world’s reefs are under increasing threat from manmade depredations. 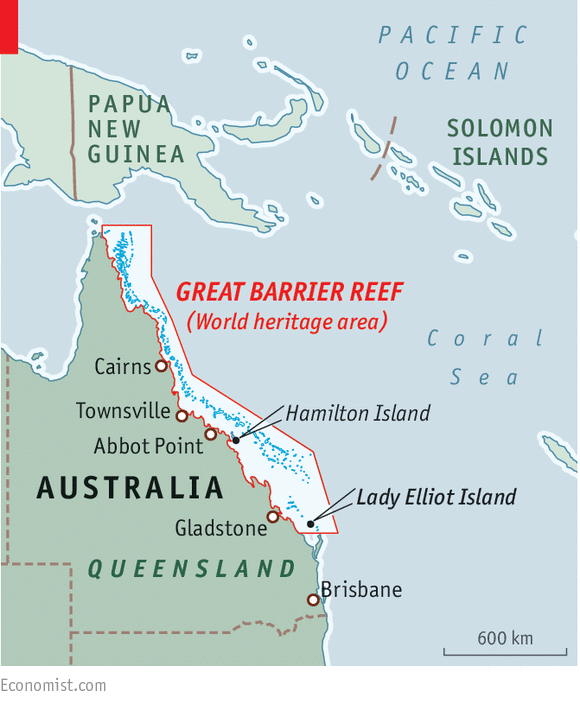 In a few weeks, members of Unesco’s world heritage committee will meet in Bonn to discuss a simple, but disturbing proposition: that Australia’s Great Barrier Reef, the world’s largest coral reef system, be listed as being “in danger”. The reef, worth an estimated $Aus5bn (£2.6bn) a year in tourism to the nation, is a world heritage site and contains more than 400 types of coral and 1,500 species of fish. Set in turquoise waters off the coast of Queensland, the 1,400-mile reef is one of the planet’s greatest wonders, but is now being eroded at an alarming rate. Rising sea temperatures, increasing ocean acidification, swelling numbers of cyclones in recent years, pollution problems triggered by fertiliser and sewage run-offs from farms and cities, and damage caused by the development of ports on the east coast of Australia to help the country to supply China with coal have had a combined and devastating effect on the Great Barrier Reef. In the past 30 years, it has lost half its coral. Had the Taj Mahal, another world heritage site, lost half its structure, there would be no doubt that it would be deemed to be in danger. Hence the pressure from green groups to give the reef such a listing, a damning status that has so far been awarded to only 46 of Unesco’s total of 1,007 world heritage sites. 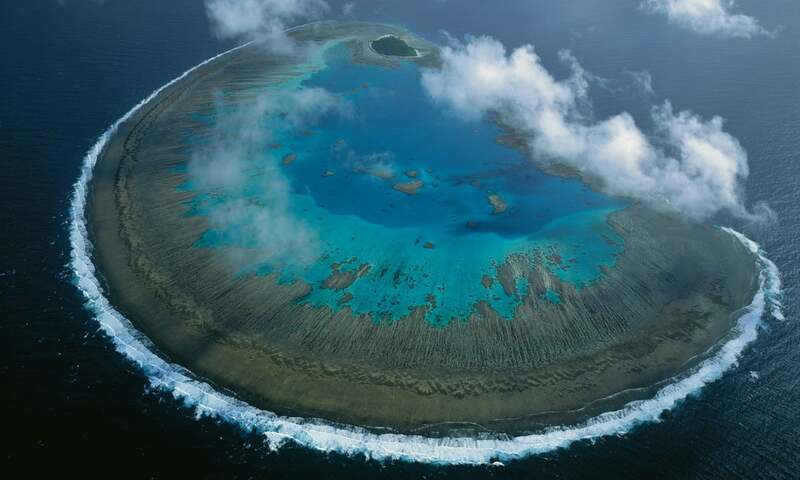 Lady Musgrave Island in the Unesco-listed Great Barrier Reef marine park. Unesco will decide in June whether to list the reef as ‘in danger’. The prospect has only recently produced a response from the Australian government. Its prime minister, Tony Abbott, has realised that the tainting of one of his country’s major attractions as being in danger – and, by inference, poorly managed – is not good for tourism and has hastily introduced measures to curtail pollution and given pledges to spend several billion dollars on reef relief work. It remains to be seen if these measures will be enough to halt the Great Barrier Reef’s decay or save it from an “in danger” listing by Unesco. There is, in fact, only a limited amount that Australia can do on its own to save the reef. Many factors lie beyond the nation’s immediate control. 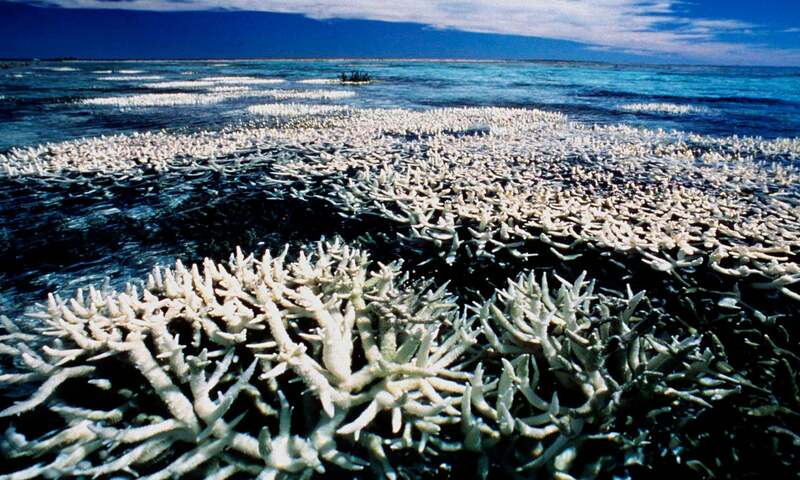 In particular, rising temperatures round the world and increased ocean acidification, both caused by soaring global emissions of carbon dioxide, are today destroying coral across the planet, while a third factor, over-fishing, has now brought the status of most reefs to crisis level. According to a report co-authored by British and Australian scientists and published last week, the planet’s already beleaguered coral reefs, which are some of Earth’s most important nurseries for marine life, are now being further assailed by industrial fishing fleets. The researchers examined more than 800 reefs in 64 locations around the world and found that 83% had lost more than half of their fish, most of these losses having occurred since the 1970s. Apart from the danger posed to many species of fish, the impact on reefs themselves is also alarming, the scientists warn. Rudderfish, parrotfish, damselfish and other reef denizens eat invertebrates and remove algae, which can smother and kill off coral. Take away these piscine predators and the reef starts to decay. And even when protective measures to control and limit fishing are imposed, it can take up to 60 years for a reef to recover. It is a gloomy vision, though the authors of the report also point out that they were encouraged to find that, when some form of management is imposed at a reef, substantial amounts of biomass, both fish and coral, can survive there. In other words, by managing fisheries, some coral reefs could be given a chance to thrive. In the long term, however, it is hard to be optimistic. Rising ocean acidification – “the evil twin of global warming” – will continue until fossil fuel burning and carbon dioxide emissions are curtailed by international agreement. Only then is there a chance that coral reef erosion will stop. We should be under no illusions about what is at risk. Coral reefs occupy less than 0.1% of the world’s ocean surface, but provide homes for around a quarter of all marine species. Their value to the planet was once summed by David Attenborough in an interview in the Observer. As he observed, if you want beauty and if you want to see wildlife, there is no better prospect than a visit to a coral reef. 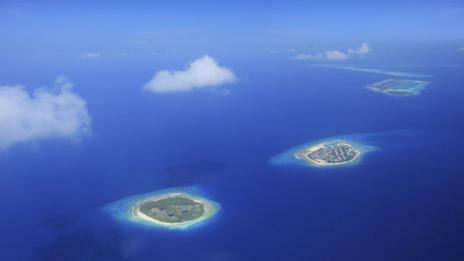 These places abound with brilliantly coloured fish and corals. As Attenborough put it, the sight is mind-blowing. The world therefore has a choice: curtail industrial fishing and limit carbon emissions – or risk losing these natural wonders forever. 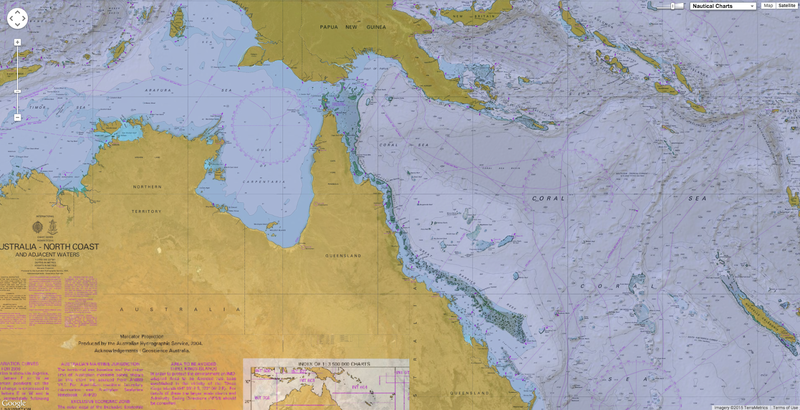 GeoGarage blog : 3-D maps reveal depths of sea floor / Oil leakage threatens Great Barrier Reef / Google SeaView : Ocean survey launches on Great Barrier Reef / Dive into the Great Barrier Reef with the first underwater imagery in Google Maps / Great Barrier Reef has lost half its corals since 1985, new study says / Australia admits barrier reef conditions are poor / Ships threaten Australia's Great Barrier Reef / 'Un-mappable' Great Barrier Reef finally mapped in 3D / Has the Great Barrier Reef just been approved for destruction by the Australian government? The video shows the main traffic routes followed at global scale by ships flying the flag of States contributing to the EU Long Range Identification and Tracking (LRIT) Cooperative Data Centre (CDC): all EU Member States, Iceland, Norway, and Overseas Territories of EU Member States*. The LRIT vessel positions are refreshed every 6 hours and reconstructed every hour using the European Commission Joint Research Centre's “Blue Hub” technology. The video covers a period of one month, giving a first insight into the potential of the data for performing statistical and other analysis of maritime transport routes of vessels flying EU LRIT CDC flags. 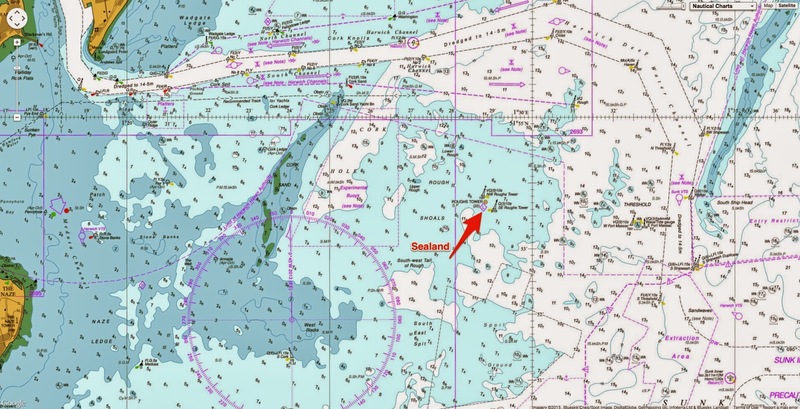 The LRIT vessel positions can be polled over delimited areas by operational authorities in specific circumstances such as for Search and Rescue. In these cases, there appear also data from States not participating in the EU LRIT CDC, leading to flashing spotlights in the animation (e.g. in the Atlantic Ocean or in the Mediterranean Sea). 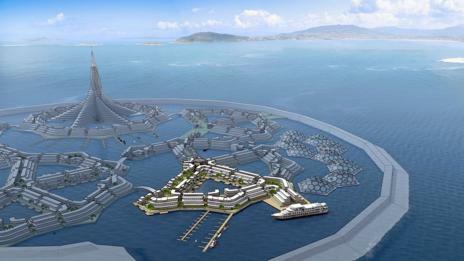 Cities, towns, shipping routes, global roads and air networks are all changing Earth. This video shows the extent of this change.